He goes on to explain that a teacher is a vehicle through which God is experienced. God uses that teacher to teach. We are an empty vessel and then God comes through the vessel like water poured from a vase. That is a teacher. As I contemplated all sorts of things around this time of year, as its my birthday and a new year in the calendar, I wanted to write up a Manifesto of a Yogini. I thought there must be something out there already but when I did a quick search there was nothing that resonated. It’s very simple, just as yoga is to me. Yes it can be challenging and difficult. 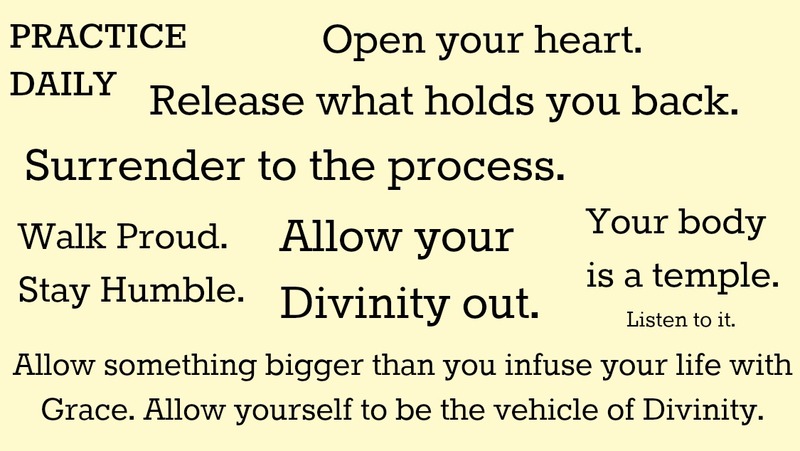 But that’s part of the process of release that leads to Divinity. When I come to class it is simple: Do these postures, use the breath or mantras and unite body, mind and spirit. Attain union with God. When I teach a class it is simple: May Source, God, whatever you want to say, flow through me so the students experience union with God. Then I let go and surrender to that flow.